Back on December 20, of 2018, Troop E Troopers were dispatched to a home in Griswold. The reporting party stated that their juvenile child had sexual relations with a 27 year old man the day before on the 19th while the juvenile was home sick from school. Troop E initiated an investigation. On Feb 14 of this year, an enlisted sailor at the Groton Submarine base, 27 year old Chazzman Chung admitted to starting a relationship with the juvenile on the social media app known as “Grindr.” Chung admitted to picking up the juvenile in Griswold without permission from his parents and brought him to the Navy Base. Chung admitted to sexually assaulting the victim in his barracks, then returning him back to his home in Griswold. An arrest warrant was drafted out of New London Superior Court and because it happened at a Military installation which has Federal jurisdiction, the Naval Criminal Investigative Services, or NCIS, would conduct an investigation as well. 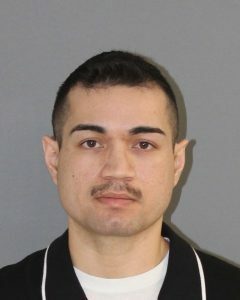 Chung turned himself in at Troop E in Montville on April 9th. Chung was released on $100,000 bond and will appear at Norwich Superior Court on April 18, 2019 for arraignment.